The Trainer Snippets report shows that Rod Millman has an excellent record with last time out winners. From his last 58 such runners, he's had 15 winners (25.86%) and 25 places (43.10%), for level stakes profits of 16.93 and 11.86 respectively and an Impact Value of 1.37. He runs Glory Of Paris at Kempton tonight in a six-furlong handicap who fits the bill. The form of Glory Of Kempton on the all-weather courses is far superior to that on the turf, with two winners and three places from four races so far. Although being short of room, he ran on well to win a six-furlong handicap at Chelmsford last time out and has only been hit with a two-pound rise in the weights for that win. He is up in class today, but as he was value for further than the final winning distance at Chelmsford, I think there could be more to come from him. As well as having a good record with last time out winners, Millman has also been among the winners from the few runners he's had recently. Over the past month, he's had two winners (50%) and three places (75%) from four runners, for level stakes profits of 6.50 and 7.70 and an Impact Value of 4.19. He also has a useful record here at Kempton. Over the past year, he's had four winners (14.81%) and nine places (33.33%) from 27 runners, for level stakes profits of 11.50 and 10.32 respectively and an Impact Value of 1.47. Jockey William Carson is 1/4 (25%) over the past couple of weeks for a level stakes profit of 1.50 and an Impact Value of 2.12. The Instant Expert shows that Glory Of Paris is not massively well suited to today's conditions, with sections of green for the course and going, but red sections elsewhere. Sparkalot appears really well suited though with a full line of green and is definitely one to keep an eye on. 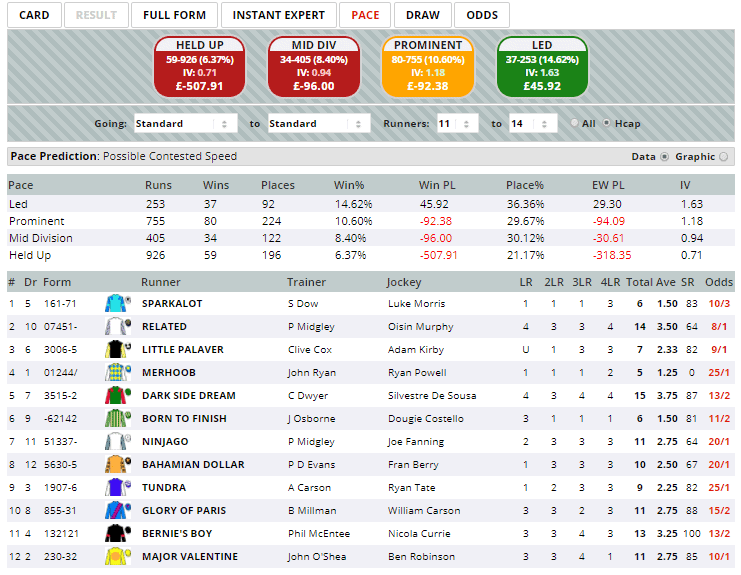 He is five pounds higher than for his last victory but looks to have things in his favour for another big run. The Pace report shows that early leaders here over this distance have the best record, with 14.62% of them going on to win the race, for a level stakes profit of 45.92 and an Impact Value of 1.63. Glory Of Paris usually races quite prominently and I am hoping that Carson can get him into a good position before the final couple of furlongs and that he is able to avoid any trouble in running this time around. if he is able to do that, then I think he has a good chance at a current price of around 9/1.